Three years have passed since the big earthquake, followed by an enormous tsunami, hit the north-eastern coast of Japan, destroying the lives and livelihood of thousands of people. It also set of the biggest atomic disaster since Chernobyl, a legacy that we will have to pay for and by our lives for the next hundred of years. This all happened on 11 March. 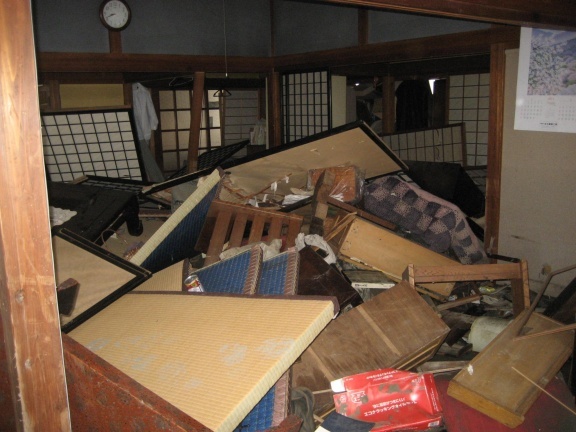 One week after this, exactely 3 years ago, together with two friends we set off to drive to Ishinomaki, one of the places hit worst, in the hope that we can reach it and contribute a bit of volunteer work. This was one of the bleakest times in my life, but at the same time one very rewarding. 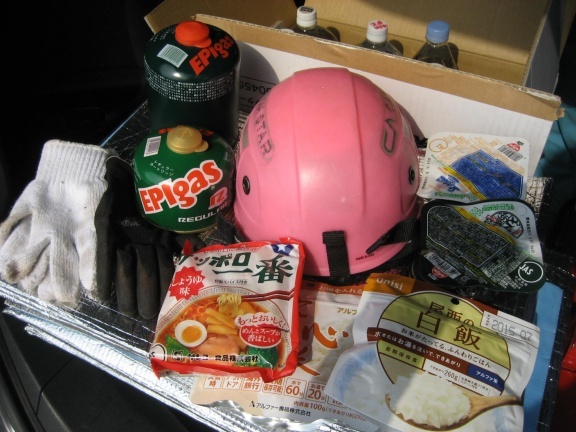 Going to Tohoku before any regular volunteer service has started means being prepared for everything. And that means really everything. Besides packing normal camping equipment, we had to bring all our food, all our water, and all our gasoline ourselves. It was obvious that all of these items will be in shortage in Tohoku. Cramming all the equipment, plus three people into a small car we left late at night for Ishinomaki. The way to Ishinomaki was not easy. Highways were closed or restricted to emergency cars, and closing in to Tohoku all gasoline stands were shut down. And from Sendai on we entered into the complete darkness. No street lights, no shops, not even vending machines. Only the moon shone onto cars turned upside down in the paddies, collapsed houses. It was the feeling of war. Deep depression, and fear, running through us. These moments of darkness are still very strong in my heart. I cannot imagine how the people living there, kids, could have dealt with that. 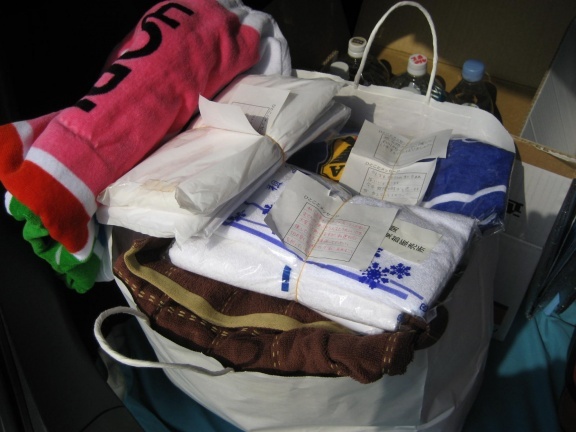 And although it is only a small thing, we brought well-wishes from school kids in Ishikawa, together with small presents, towel, necessities, to Tohoku, in the hope to give a bit of light to those in need. Arrived at the emergency center. Volunteers are still not expected. We spend half a day delivering goods with a truck to various emergency shelter. Everywhere long lists, missing people. Sadness. Hope. All the infrastructure had broken down, nothing worked, and the most important for everyone was water. Delivered in tanks, distributed to people queuing up for hours. 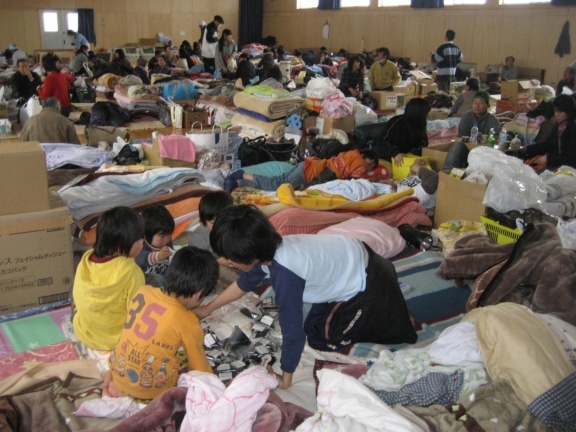 Inside the emergency shelter, people who have lost their houses, who don’t dare to return. Face to face, hip to hip, no space left. Kids crawling around, noise buzzing. But all still very civilized, ordered. Everyone knows how to behave, everyone tries to make it as comfortable for everyone as possible. 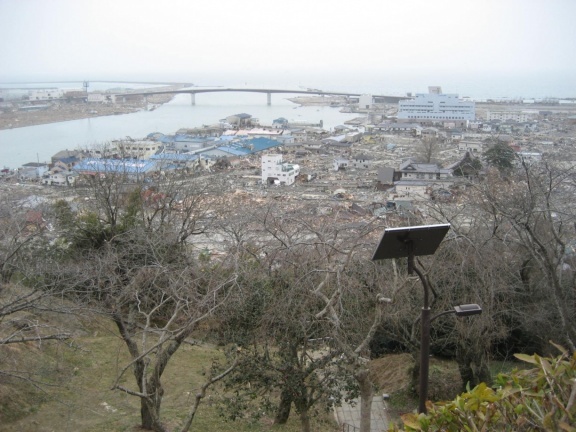 View down onto the destroyed part of Ishinomaki. Everything not enough elevated from the sea level was flattened. Nothing remain. Nobody wants to think how many people are down there. In there. One of the houses near the sea side. The earthquake would have been a piece of cake, old as it is, it could have stood the earthquake without structural damage. Not so the tsunami. It washed away everything. We spent two days there. After the initial half day distributing goods we set off by ourselves, searching local help groups, were sent of to those in most need. Digging through mud for hours. The only return was a smile, but it was the best return. The most valuable. If it was one thing that I brought back from there, it is the optimism that the people had at that time. The openness, friendliness. Helping each other in the darkest of times. Here, during some onloading, me chatting with school kids of the school-converted-emergency shelter. There was a lot of optimism at that time, and after it. Rebuilding Japan! But what is left are hard facts, and news that focus on Fukushima. Fukushima is horrible, and it will be like this for long long time. 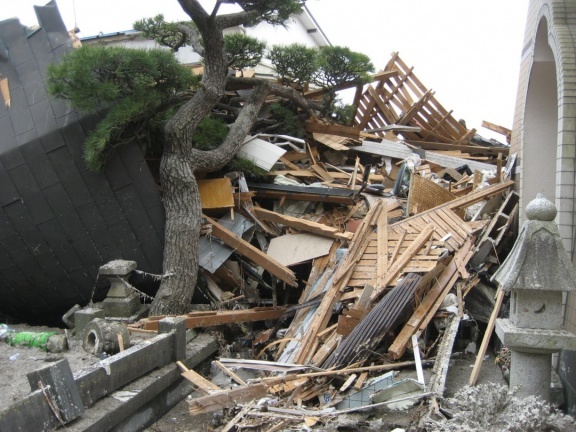 But the northeastern coast of Japan is still, in long stretches, destroyed. People have no homes, no work, living in emergency cubicles, spending their time with nothing at best, pachinko at worst. Attention has shifted, attention has narrowed to Fukushima. Because it is international. But I don’t want those people be forgotten who still, three years after, have nothing. Reconstruction is slow or non-existent. According the the European Parliament Research Service, about 300.000 person are still living in makeshift temporary shelters. And reconstruction works are scheduled to be stopped in 2 years? And within all this, Olympia 2020 will come to Tokyo. Money bitterly necessary to rebuild Tohoku will be drained to prepare some super-nice new arenas. The Japanese government under Abe, incapable of handling either Fukushima or Tohoku, trying to divert attention to the Olympics. 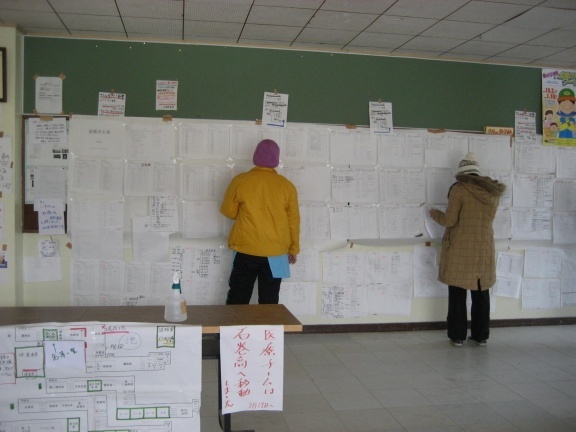 But what will happen in rural Tohoku, nobody knows. I hope it will not sink back into complete oblivion over the euphoria of Olympia. These people have lived through horrible things, for long time. I am grateful, grateful to my friends who took me with them to Ishinomaki, grateful for all the people I met there, and grateful for this experience, how disturbing it has been, I will not forget. 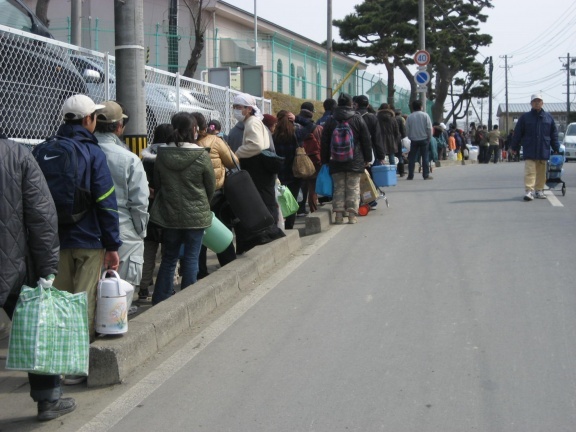 See more photos at the album Volunteering in Ishinomaki March 2011. Grazie per il commento, ma sono piccolo in relazione a quest persone!